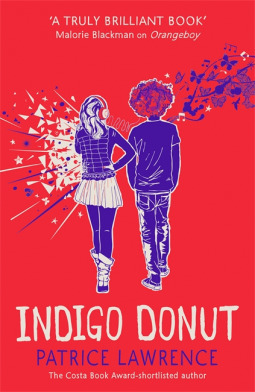 I am currently reading Indigo Donut by Patrice Lawrence. It was coming back again, like a film on slow stream, except someone had hit the mute button. The silence made it worse - it meant everything else was turned up to full. I have been so incredibly excited for this book since it was announced. I loved the author's debut Orangeboy, so I had high expectations starting this. I was lucky enough to hear the author read a passage at NETBA which just made me more excited. And so far my expectations have been met. I am again in love with the story and the writing. Mum was very surprised. She sniffed the plate, then picked at the meat in silence. Dad sat opposite, chewing his veggie sausages. This scene on page 56 is half heart-warming, half hilarious. I am loving how family is explored in this story, all of the nitty gritty and different sides. The only problem is that I'm reading this very slowly so I can eke it out for longer! Again, Patrice Lawrence has written a wonderful book, and I don't want it to end. Ooh I like those snippets. Thanks for sharing. Looks like a good book. I like the quotes. It seems like an interesting story. I don't think this one is for my. I hope you enjoy it. This week I am featuring Her Dark Half by Paige Tyler. Happy reading! You have me quite intrigued with these snippets! Happy long weekend! The title is certainly original! Probably not something I'd read, but I'm glad you're enjoying it. I've got this one waiting on my shelf. Looking forward to picking it up.